Writing the same topic from different angles can help pin down your audience and your subject. As the long tail effect has taught us, broad, rich and on-topic content will attract the audience you are aiming for. So you’ve beefed up your blogging efforts; pumping out relevant content, regularly. You are using the the methods you’ve uncovered to write audience attracting articles. You are gaining traffic and renown for your insight. Sound Advice: On topic, and on the money. List Format: Makes for easy reading. Bold Lines: Emphasize your main points. Short Paragraphs: Create the illusion of concise thoughts. Encourage Comments: Build content from the mob. Don’t be so quick to check that topic off your list. Even though that article will persevere in the search engines, there’s still so much more to squeeze from the topic. 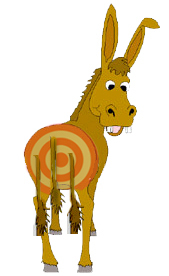 Go ahead, pin the Long Tail on the Donkey. 57.8% of our daily homepage traffic is a new audience. What you present, is what they read. Revisiting a topic is new for more than half your readers. 2. Building Support In The Search Engines. Items that share similar keywords and topics will appear as ‘support’ in the search engines. EX: “epro class” in Google shows more than one article ‘tied’ together at the top of the results. EX: Same results for “real estate blog copy“. Developing a topic from different angles simply broadens the magnetic content in the article. EX: Copyblogger has as least 20 powerful articles on headline writing. Revisiting core topics that your audience are most interested in keeps presenting your insight as ‘up to date’. OK…I’ll resurrect some of those subjects and take another look at them. Thanks for the fresh outlook. It makes me think and that is more than my teachers were able to do. You are very correct about taking another look at subject matter. The subject itself changes over time as does our audience. And one blog-post doesn’t completely flesh out an issue. OK Teach! Review, rewrite, review. Excellent points and more homework to do. Thanks.